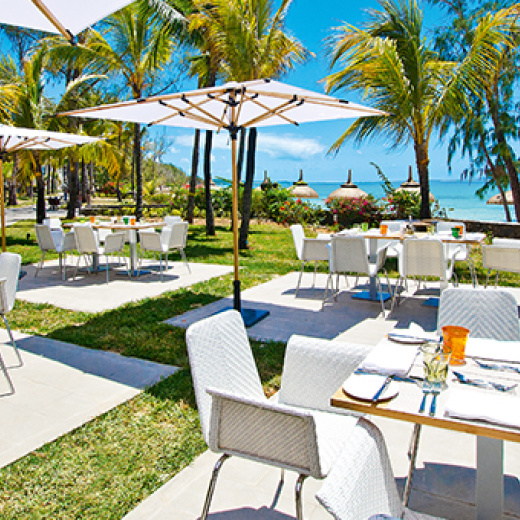 Located on the east coast of Mauritius, this 4-star hotel is housed along a sunny paradise bay. Its beautiful white sand beach, close to 700 meters, facing the crystal blue waters of a lagoon and the Indian Ocean. The hotel is only an hour drive from the airport and Port Louis , the capital. Twenty minutes to get to the Ile aux Cerfs. This exceptional Bay is an invitation to swim and discover the rich marine life. The rooms elegant and colorful, most with sea views, are located in the heart of tropical vegetation preserved sumptuous gardens. With their stylish decor and contemporary style, the rooms at this 4-star hotel in Mauritius are true bubble of serenity and freshness located just a few meters from a sandy beach. Mauritian cuisine is enriched with 3 new restaurants while Amber bars you unveil its wonderful tropical cocktails, arranged and other treasures Mauritian rum. The hotel's Mauritian Spa offers four treatment rooms, a hammam, a sauna and a Jacuzzi. Deliciously romantic, outdoor kiosk allows you to enjoy a treatment while watching the ocean. A must for couples to enjoy during a honeymoon or wedding in Mauritius! It is with the products of international brand Germaine de Cappuccini the team trained and experienced therapists will ensure your well-being. The hotel also offers a variety of activities and offers many amenities for relaxation, play and sport.The most active fans as "sweet tiredness" everyone will benefit their way of quieting their holidays! Sports & Leisure animations of your Mauritian hotel are offered from 7:00 to 20:00. In the heart of this hotel in Mauritius, extends to the beautiful beach pool 735 square meters. This huge dream pool is composed of several areas bath and relaxation. Guests in the hotel have preferential access to Le Touessrok Golf Course, located on the famous Ile aux Cerfs. This superb 18 hole par 72 international has been designed by the legendary champion Bernhard Langer.